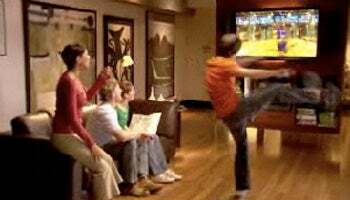 At E3 2009 yesterday, Microsoft blew the media away with Project Natal, a motion sensing device that allows you to control video games and Xbox 360 menus with your body instead of a peripheral controller. Natal gives you voice and full-body motion control over your on-screen avatar using an RGB camera, depth sensor, multi-array microphone, and custom processor running proprietary software. Project Natal will work with current XBox 360 systems. Microsoft also released yesterday the Project Natal software development kit to game makers who want to incorporate Natal functionality into their products. Based on what Microsoft was showing off at E3, Natal promises to open up a new world of gaming, and bring us one step closer to a Minority Report-style future--Microsoft's Natal demo included an appearance by Minority Report director Steven Spielberg. But Microsoft is making some big claims with Project Natal, and Redmond's demonstration left some crucial unanswered questions about Natal and its future under the Xbox brand. When will Project Natal be available? Since Microsoft has released a Project Natal SDK, the motion-control system should be far along in the development process. But when will we see the device on store shelves? So far, Microsoft isn't saying, and you can bet they won't be releasing the hardware until you have several games to use it with. So it's likely we're at least a year away from seeing Natal-specific software and hardware on store shelves, but it could be much longer especially if the technology encounters any unanticipated difficulties. Will Project Natal work as advertised? The Natal-specific games Microsoft showed off yesterday at E3 were very Wii-like in their look and feel. One was a futuristic variation of Pong called Ricochet, where you would smack bouncing balls with your legs and arms against a wall; the other was something called Paint Party, where you use your avatar to create murals against a virtual canvas. Both games used very basic graphics and the movements required to play them were not particularly advanced. That may be due to the fact that both games were prototypes used as proof-of-concept software rather than commercially available games, but it wouldn't surprise me if earlier versions of Natal were rather limited in what they could do. However, Microsoft also provided a video showing off other uses for Natal including a martial arts fighting game, a Pole Position-style racing game and some kind of Godzilla meets Pokemon rampage fantasy. But in the Natal demo video Microsoft was quick to state that the games shown were a product vision and that actual features and functions may vary. Microsoft is famous for these types of product vision videos where it shows off what it thinks the future will look like. Those videos always look cool and are almost never accurate. The difference here is that Microsoft has a physical prototype accompanying its vision. But those disclaimers from Microsoft make me wonder how functional Project Natal really is. Natal looks like an exciting piece of hardware, but that excitement could wear off pretty quickly if Natal peripherals are too pricey. Part of the popularity of the Wii is not only its innovative motion control gaming, but also its low price compared to the Xbox 360 or the PS3. Microsoft's device looks more innovative than the Wii, but that doesn't mean the company should charge exorbitant amounts for Natal. There's also no word on how Natal will be packaged. Will it only come in some kind of Xbox 360 bundle or will you be able to pick up Natal to add to your current system? Also, how many pieces make up Natal? Will Natal components be all in one box or will Microsoft leave out some crucial component that you have to buy separately? How complex can Natal games get? Microsoft created Natal to lower the bar of entry into modern gaming to anyone that can move his or her body, but will Natal appeal to the more advanced gamer as well? Painting elephants and playing handball might be fun, but what about crouching down in the brush to ambush enemy soldiers, taking cover behind storage containers on a space station loading dock or having a high-flying lightsaber duel against a Sith Lord? That may be the inevitable future of gaming, but is Natal the technology to do it? If Natal really does end up having that kind of functionality, I hope Microsoft is smart enough to give you the choice of switching back to a conventional controller for those days you just can't bring yourself to get off the couch. Will Natal be backwards compatible with current games? Imagine if you could plop in your favorite edition of Halo or Call of Duty and start firing away without a controller? Backwards compatibility is an important feature for many gaming systems that are within a generation or two of each other. Backwards compatibility adds value for the user with a stockpile of games at home, and makes it far more likely that people will snap up the manufacturer's latest toy. Natal may be one of those products that is so hot and so far advanced that backwards compatibility with older games is either impossible or unnecessary, but it sure would be a nice feature. So those are the questions on my mind as we look toward the future of gaming. What do you think? Will Project Natal work as advertised, or is Microsoft's new non-controller controller just a lot of hype?